The GigaWorks T20 Series II Creative takes speaker design a step further forward. The new two-piece system based on its successful predecessor, and glossy black finish, has been carefully refined to enhance its visual appeal and acoustic parameters. The result is a truly admirable level of quality. This photo is disabled from Colorbox and will not, therefore, appear in it. Built to recreate realistic live music experience in your home, the sleek and stylish GigaWorks T20 Series II is made for excellent desktop performance with rich, full audio like no other. Based on its successful predecessor, the new two-piece system with glossy black finish has been painstakingly refined to enhance its visual appeal and acoustic parameters. The result is a sleek and stylish system with truly impressive performance. The GigaWorks T20 Series II can reveal the true potential of your favourite music. It is equipped with high-quality cone drivers and dedicated high frequency tweeters for perfectly balanced audio, complemented by Creative's BasXPort technology for rich extended bass without a subwoofer. Two inputs allow you to connect a PC and MP3 player at the same time without having to swap cables. 3,5mm Jack, RCA - Cinch Done! For shipping to other EU countries visit this page Creative GigaWorks T20 Series II. Für Versand nach Deutschland, besuchen Sie bitte Creative GigaWorks T20 Series II. Chcete doručit zboží do Česka? 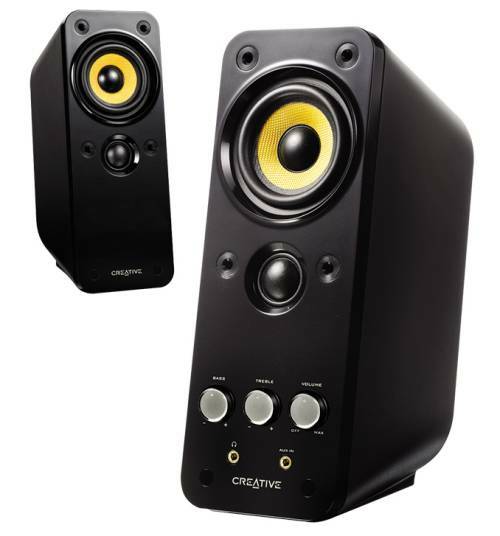 Prohlédněte si Creative GigaWorks T20 Series II. Chcete doručiť tovar na Slovensko? Prezrite si Creative GigaWorks T20 Series II. Für Versand nach Österreich, besuchen Sie bitte Creative GigaWorks T20 Series II. Magyarországra történő kiszállításért tekintse meg ezt a termékoldalt: Creative GIGAWORKS T20 Series II.